The 1990 New Zealand general election was held on 27 October to determine the composition of the 43rd New Zealand parliament. The governing Labour Party was defeated, ending its controversial two terms in office. The National Party, led by Jim Bolger, won a landslide victory and formed the new government. The Labour Party had taken office after defeating the National Party under Robert Muldoon in the 1984 election. David Lange became Prime Minister and Roger Douglas became Minister of Finance. The economic program outlined by Douglas was deeply unpopular with Labour's traditional supporters, however — deregulation, privatisation, and free trade, all opposed by the party's more left-wing members, were a key part of the so-called "Rogernomics" platform. This internal dissent was off-set somewhat by new social legislation and a strong stance against nuclear weapons. Labour was re-elected in the 1987 election with its parliamentary majority untouched, but the internal disputes continued. Eventually Lange forced Douglas to resign in December 1988, but the crisis had weakened Lange's position such that he resigned eight months later. He was replaced as Prime Minister by Geoffrey Palmer, but Palmer failed to revive Labour's falling popularity. Several months before the election, Palmer was replaced by Mike Moore. 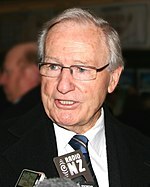 The National Party was performing strongly — its leader, Jim Bolger, spoke repeatedly of "the Decent Society", saying that the reforms were doing significant damage to the social fabric of the country. The government was also being challenged by the NewLabour Party, founded by renegade MP Jim Anderton. The date for the 1990 election was 27 October. 2,202,157 people were registered to vote, and 85.2% of these people turned out. The number of seats being contested was 97 — this was the same as in the previous election, which had the largest number of seats for any Parliament until that point. The 1990 election eventually saw a victory for the National Party, then in opposition. National won nearly half (48%) of the vote and 67 (69%) of the seats, becoming the fourth National government. This was the highest number of seats the party had ever won, either in absolute terms or as a percentage. Four new (and young) National MPs: (Bill English, Tony Ryall, Roger Sowry and Nick Smith) were called the "brat pack" by Sir Robert Muldoon (himself one of the "Young Turks" of 1960). The new Green Party gained the third-highest number of votes, but won no seats. 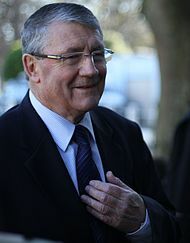 The NewLabour Party won a single seat, due to Jim Anderton retaining the Sydenham seat he originally won as a Labour candidate. The governing Labour Party, by contrast, suffered its worst-ever electoral defeat since it first won power in the 1935 election, winning only 29 (30%) of the seats and 35% of the vote (its lowest percentage since 1931), and losing 27 seats. Initially it appeared that twelve ministers and the Speaker had lost their seats, but Fran Wilde scraped in on special votes. Many of Labour's talented "class of 84" were sent away, though four of them, Annette King, Jim Sutton, Trevor Mallard and Judy Keall, returned in 1993. The result was primarily due to intense anger at Labour and its policies (shown by it losing 12% of its vote) rather than love of National (which only increased its vote by 4%). There was no redistribution of electoral boundaries between the 1987 and 1990 elections. By National: Birkenhead, East Cape, Eden, Gisborne, Glenfield, Hamilton East, Hamilton West, Hastings, Hawkes Bay, Heretaunga, Horowhenua, Kapiti, Lyttelton, Manawatu, Miramar, New Plymouth, Onehunga, Otara, Roskill, Tasman, Te Atatu, Titirangi, Tongariro, Waitaki, Wanganui, West Coast and Western Hutt (27 seats) were captured from Labour. Six of these (Gisborne, Hastings, Lyttelton, Miramar, New Plymouth, and the West Coast) were one-term gains, recaptured by Labour in 1993. The seats of North Shore, Papakura, Tarawera, Waitotara and Wallace, all held by departing National MPs, were won by new National candidates. The seats of Christchurch Central, Dunedin North, Eastern Hutt, Manurewa, Nelson, Palmerston North and Panmure, all held by departing Labour MPs, were won by new Labour candidates. ^ * "The Brat Pack loses a member". Stuff/Fairfax. 25 May 2014. ^ a b Bassett 2008, p. 538. ^ "New Zealand Elections 1972–1993". New Zealand Election Study. Retrieved 17 December 2011. McLeay, E. M., ed. (1991). The 1990 General Election, Perspectives on Political Change in New Zealand: Occasional Publications No 3, Department of Political Science. Wellington: Victoria University of Wellington. ISBN 0-475-11202-4. Stringer, John (1990). 1990 Parliamentary Candidates for the New Zealand National Party. Wellington: New Zealand National Party. Vowles, Jack; Aimer, Peter (1993). Voters' Vengeance: The 1990 Election in New Zealand and the fate of the Fourth Labour Government. Auckland: University Press. ISBN 1-86940-078-X.